A gangster is put in prison, but finds salvation through music while serving his time. Again on the outside, he finds success elusive and temptations abound. The lady editor of a crime magazine hires Philip Marlowe to find the wife of her boss. The private detective soon finds himself involved in murder. After crooked nightclub owner Chips Maguire murders a police informant, he blackmails his piano player to allow him to stay at his eccentric mother's boarding house. Judge and his mistress are investigated on suspicions of corruption. When a rich but cantankerous dowager on an isolated estates hires an engaging handyman, her niece/companion becomes suspicious of his motives. Charters: [at newsstand, next to display of "Mein Kampf" and "Gone With the Wind"] There's not a copy of this week's "Punch" ? Charters: "Punch." English magazine. Very humorous. You must have a copy. Charters: [to Caldicott] She hasn't got a "Punch" old man. Caldicott: Well. Sold out I suppose. 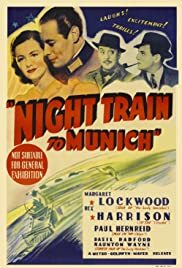 An intrepid British spy boards the NIGHT TRAIN TO MUNICH in a desperate attempt to rescue a scientist & his beautiful daughter from the Nazis. Here is an excellent wartime thriller, with just the right amount of puckish humor to keep the film from becoming too heavy. Very fine acting & excellent production values add tremendously to the success of the film, with director Sir Carol Reed showing hints of the style which would distinguish his postwar crime classic, THE THIRD MAN, a decade hence. Margaret Lockwood is lovely, but she is given remarkably little to do outside of looking anxious or scared. Not to worry, the action is carried admirably by the male side of the cast, most notably Sir Rex Harrison as the British agent. Whether glibly singing silly songs or engaged in deadly gun battles in the Bavarian Alps, he carries off his role with his characteristic aplomb. Paul Henreid completes the quasi-romantic triangle. Menacing & sophisticated, he is an excellent example of Nazi determination & evil. Sir Felix Aylmer, very effectively playing against type, wraps his unique voice around the small part of a German spy master. Roland Culver, Torin Thatcher & Ian Fleming - the character actor, not the author - might be glimpsed in cameo roles. Fans of Sir Alfred Hitchcock's splendid THE LADY VANISHES (1938) will be heartened at seeing the return of the characters Charters & Caldicott, those criquet-mad twits, played by the original actors, Basil Radford & Naughton Wayne. Their initial performances had proved so successful that they were given the opportunity to reprise the roles several times, this being the most successful of their reappearances. Their inclusion here, about two-thirds into the story, gives the film a decided lift, making the whole procedure jolly good entertainment.